It’s that time of the week again! Last week I covered Valla the Demon Hunter from Diablo III. 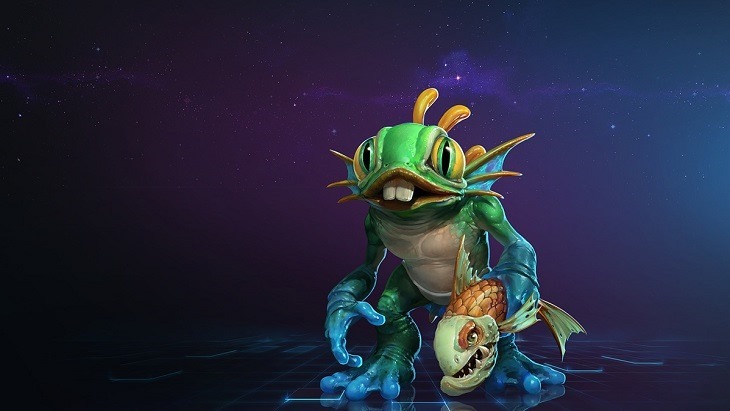 This week we move over to the Warcraft universe, focusing on the ridiculously cute Murky the Murloc. I have no way to describe Murky other than as a nuisance. He is really easy to kill, but he has an ability that allows him to respawn in a mere 5 seconds. Want to kill him? Best you find that pesky egg first! Check out his trailer. 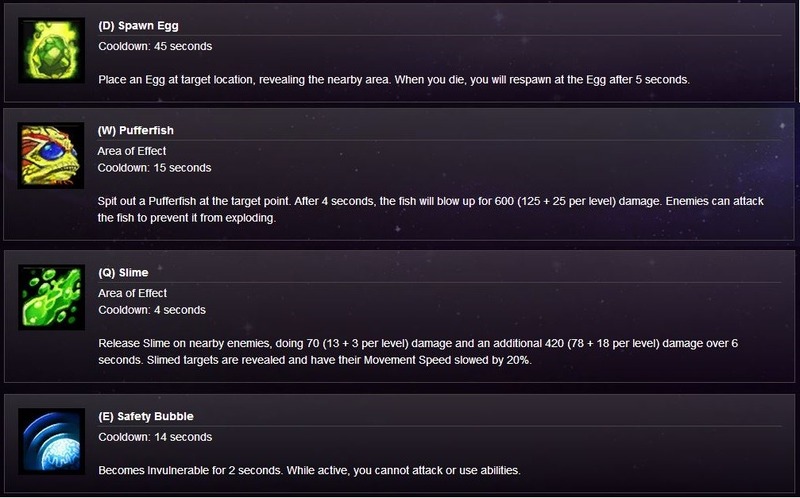 Spawn Egg is the ability that makes Murky particularly annoying. Killing him while there is an egg up will give a whole lot less XP, so make sure you find it before trying to take him out. As a Murky player, keep your egg safe at all times. While you may not be giving the enemy team as much experience by dying with it still active, that doesn’t mean you should just go ahead and die as often as possible. Pufferfish is a really nice AOE spell, it just takes long to charge up. Throwing it at towers works well as they will not attack it. Enemies however, can destroy it in a couple of hits. Slime has a really low cooldown, so it can be spammed a lot. I really underestimated this spell. It does a fair amount of damage, especially if used consistently. Safety bubble is your safety mechanism. Use it to get away from any danger, or use it to get right into the thick of things to lay down a nice ball of slime. Murky has two rad ultimate abilities. March of the Murlocs I find is great for making a big push into some towers. Enemies will probably avoid fighting you while it is active. It also does a fair amount of damage too. There is a long cooldown though, so it can’t really be spammed. Octo-Grab is a really nice team fighting ability. I also underestimated this spell when I first saw it. The low cooldown means it’s relatively spammable. It’s great for locking down any solo enemies, making them an easy target for your team. First and foremost, find a nice place for your egg. You can choose to be risky by putting it pretty far up in the lane, or play it safe and keep it behind a tower. You need to keep an eye on it at all costs. If an enemy finds it, they will kill it, and it will make you a really easy target. Murky has a laughable health pool, which means he can be killed in a few hits. Obviously, if you are up against a Murky, keep this in mind and try find his egg if possible. I don’t know why, but I always tend to build Murky as a pusher. There are talents which make his fish do more damage and take more hits to kill. There are also some nice slime talents which give it extra damage for example. While these can be used for pushing, they are equally useful in team fights. See how the game is going and decide if you will have the room to constantly pressure a lane, or if your team needs your help. Take an ulti depending on the situation too. March of the Murlocs has a nice AOE and can zone an area nicely. Octo-Grab is great for singling out people and picking them off. Keep in mind that the game is still in Technical Alpha, meaning that stuff can change as it develops. If you have any recommendations, questions, suggestions, or hero spotlight requests, please do leave them below. If I can afford them with my in-game gold, I will happily do a video for them. I know some of you have requested Nova. She is just too darn expensive at the moment. I will definitely get around to her at some stage, I promise.